Class analysis is a central component of Marxist thinking. Knowing who our enemies and friends are is imperative if we communists are to move forward into the 21st century. An important aspect of class analysis is the question of exploitation. Exploitation is a condition in which value is extracted from a class of people — that is, it describes a scenario in which workers produce more value than they receive in return. Because value is labor-time, exploitation effectively amounts to the robbery of workers’ time. Exploited masses are not fully remunerated for the time they expend, and thus they are prevented from really flourishing. This is why the proletariat — the exploited workers — are revolutionary in the final instance. So, it is important to know where the exploited people are, and the question of exploitation is one that political economy is poised to provide insight into. Certainly, political economy is not all there is; it is only one of the three central components of Marxism (the others being philosophy and scientific socialism). We must strive to qualitatively understand our evidence using dialectical and historical materialism. Yet, an economic investigation is undeniably a part of answering the class question. Third Worldism is a trend within the communist movement that, among other things, holds that a rigorous application of Marxism to the world today reveals that the class analysis put forward by mainstream communists in the First World is severely lacking. In particular, we believe that a majority of workers in imperialist centers have been “bought off” using super-profits generated from Third World labor, and thus they have a material class interest in maintaining the order of capitalist-imperialism. The historical materialist thesis behind this position has been put forward in books like J. Sakai’s Settlers: The Mythology of the White Proletariat. Presently, we will approach this question from a different angle: from the perspective of political economy. Critics of Third Worldist political economy have sometimes objected that we have gotten too bogged down in bourgeois economic figures. Some have also opined that our work has been too obtuse to be unpacked thoroughly. These are fair criticisms. Thus, it is my objective here to provide an economic analysis of First World economies that tries to cut through commodity fetishism and to frame things in terms of labor-time as much as possible. I also forgo the use of complex equations, and I explain the methodology used here in detail in the endnotes, which are posted separately due to their length. A link to the endnotes is included at the end of this piece. Before proceeding, it should also be known that from here on in, I will refer to OECD countries (Organization for Economic Co-operation and Development) as the “First World” and non-OECD countries as the “Third World.” This is a convenient approximation because many useful figures are easily available when investigating in these terms. It is also a generous approximation to the First Worldist narrative, because the OECD does contain some countries (e.g. Mexico) which are clearly not part of the First World in reality. So some of the value that I account as being produced in the “First World” below is actually produced in the Third World. With that aside, what follows is an attempt to gauge the contribution of Third World labor to imperialist economies and a discussion of some of the implications. About 40% of the product of Third World nations is exported to First World countries. One might be tempted to say that this means that 40% of the labor of Third World workers is value added to imperialist economies. However, a fair portion of what Third World workers are moving, in terms of the machinery and raw materials involved, is itself imported from the First World. So we need to subtract the contributions of capital and intermediate goods imported to the Third World from imperialist countries. When we do this, it turns out that 35% of the value contained in goods exported from the Third World to imperialist countries, or 14% of the total product of the Third World, is value added in the Third World itself and realized in imperialist economies. By IMF figures, there are 2.5 billion workers in the Third World. If 14% of their labor is adding value to imperialist economies, then we wind up with roughly 350 million worker-years of Third World labor embodied in imperialist economies each year. There are about 600 million workers total in imperialist countries. Not all of this work is adding value to imperialist economies however. We need to know how much of First World labor is productive labor. For this, we’ll use Shaikh’s and Tonak’s definition of non-productive work: any labor involved in distribution, social maintenance and reproduction, or personal consumption is not productive. When we subtract non-productive labor from the total labor performed by First World workers, we find that at most, productive labor is about 30% of the labor performed in the First World. This means that an upper-end estimate of the amount of First World labor embodied in value realized in imperialist countries is about 180 million worker-years annually. The implications here are fairly striking. Most of the value realized in imperialist countries is generated by Third World labor. 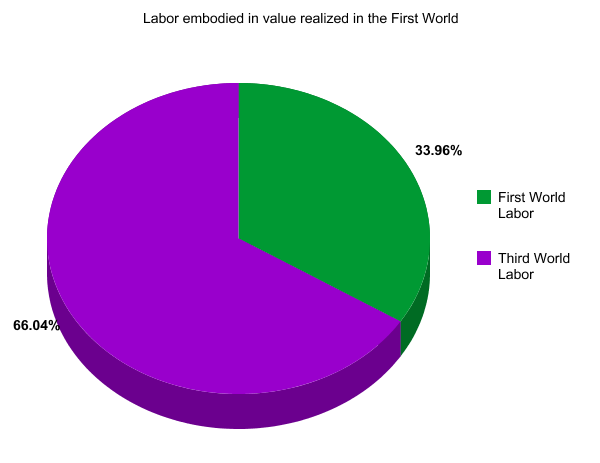 In fact, the ratio of Third World labor to First World labor embodied in value realized in the First World is roughly 2:1. For every hour of productive labor that goes on in imperialist countries, there are at least two hours of productive labor going on in Third World countries that goes into the value realized in the First World. This fact is rendered invisible by the obfuscations of bourgeois economics. We can only discover this if we cut through commodity fetishism and get straight to labor-time. What does this mean for the question of whether or not workers in imperialist countries are generally exploited? This depends on whom we consider to be “workers.” RCP-usa has held that around 90% of people in imperialist countries are workers. These days however, there is a general consensus that this figure is quite optimistic (among Maoists at least), thus we will not waste time debunking this conception. However, the PCR-RCP in kanada estimates that around 65% of people within kanada are apparently “proletarian.” We’ll go ahead and use this figure, and assume that this proportion holds for imperialist countries generally; that is, we’ll assume that only 65% of those who receive incomes in the First World are actually workers. If this is true, then the share First World workers receive of the total value realized in imperialist countries is about 40%. 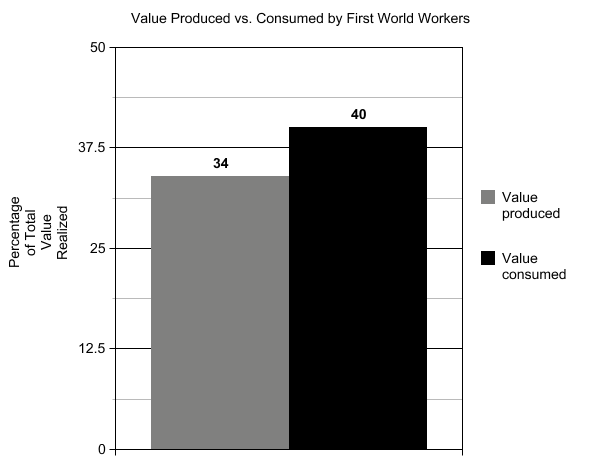 Thus, the share of value that First World workers consume is greater than the share they produce. This means that if workers constitute 65% of income-earners in imperialist countries, then their rate of exploitation is actually negative. Of course, this is an estimate made at the level of all imperialist countries, and in aggregates there are distortions. There may be some imperialist countries where a significant portion of workers are still exploited, while other countries where the workers consume much more than they produce lead the overall rate of exploitation of imperialist workers as a whole to be negative. Unfortunately, it is more difficult to make these estimates at the level of individual countries. In principle it is possible to do, just extremely tedious. In the endnotes, I have outlined a method for how one might gauge the contribution of Third World labor to individual countries. For our purposes it is not necessary to go into those details to make our basic case: that a majority of workers in imperialist countries are not exploited (more on this shortly). However, the details are there in the endnotes for anyone who may wish to venture into that territory. For now, we will simply note that, for example, if the contribution of Third World labor to the u.s. economy is anything like it is for imperialist economies generally, then by the methodology above, u.s. workers are not generally exploited. What we have demonstrated is that the notion that 65% of working people in imperialist countries are “proletarian” is completely bogus. Where do we draw the line then? Could we say that 50% of those receiving incomes are potentially exploited workers? If we were to plug this into our analysis above, we would find that First World workers are exploited, but at an extremely low rate that is almost zero. A mass of “barely exploited” workers does not make much sense. A far more realistic assessment is that there may be a small number of workers in the First World who are exploited at roughly average rates, and a large number of workers who are not exploited at all. In other words, it is clear that the proportion of workers who are exploited in the First World must be significantly less than half. How do we gauge where exactly progressive classes lie in the First World? We could look to productive workers, who are indeed the ones who produce value. However, this leaves out important sections of the population in the First World. There are many people who technically do not produce value but who nevertheless live in effectively proletarian or semi-proletarian conditions due to their subjection to various forms of oppression definitely tied to capitalism, e.g. national oppression or gender oppression. We also know that there are significant lumpen elements in the First World, defined as those who would benefit from regular employment. These elements have been pushed out of the classes who benefit from imperialism. Additionally, there are some productive workers who make exorbitant wages themselves and are almost certainly receiving in value more than they produce. Thus, we cannot simply make the blanket statement that the productive workers in imperialist countries are where the revolutionary potential is. In general it is far better to draw the line between the people and their enemies by determining the portion of the population whose material existence depends upon imperialism. In other words, we want to know who the net-exploiters are. A net-exploiter is someone who, with the earnings they receive in a day, can obtain on the market more than what a day’s worth of labor produces; they are someone who consumes the product of more labor than they expend. This holds true absolutely for the bourgeoisie, who do not perform any labor and consume an exorbitant amount of value. It also holds true for many others within the First World, including many workers. The only way for it to be possible for some workers to consume the product of more labor than they expend is if the value they receive is drawn, at least in part, from surplus value (i.e. surplus labor) extracted from other workers. That is to say, the only way for some workers to be consuming the product of more labor than they expend is if other workers are consuming less. Thus, the material existence of the net-exploiters fundamentally depends upon imperialism. The overthrow of capitalist-imperialism is not in their immediate class interest. There are also those who are consuming less labor than they expend (whether their labor is productive, non-productive, or reproductive). We would do well to determine who and where they are, for the material existence of these strata does not depend upon imperialism and these strata may be progressive or even revolutionary. Others have put forward the model of the abstract value of labor (the average value that labor produces globally) as a mechanism to gauge where the progressive classes are and are not in the First World. One or another objections might be made to this model. But at the end of the day, we do need some set of criteria to determine where the net-exploiters in the First World are or are not if we are to arrive at a more accurate class analysis of the imperialist countries than what most communist organizations in the First World have put forward. One of the most common responses to Third Worldist political economy is to invoke the concept of “productivity.” It is near-universally assumed among self-proclaimed Marxists in the First World that “productivity” in imperialist countries must be higher than in the Third World. What this might mean deserves some unpacking. There are a couple of ways in which we can think about productivity. In the Marxist sense, the productivity of labor is the ratio of fixed capital to variable capital. That is, productivity is how much in the way of machines, tools, raw materials, etc. there are relative to the amount of labor that’s going into production. What this means is that with a high productivity of labor, workers are moving a lot of means of production in a short period of time. However, when you increase productivity, and thus increase the amount of stuff being moved in a given time, the amount of socially necessary labor-time in each individual commodity goes down. The volume of stuff increases, but the total value does not. Something besides productivity has to increase for the mass of value to go up (namely the amount of living labor embodied in commodities). Many so-called “Marxists” have failed to break from the bourgeois idea that machines create value. Only labor creates value, and machines themselves are in fact dead labor (they embody labor expended in the past). Thus the existence of advanced machines and a higher concentration of fixed capital generally in the First World does not at all mean that workers in the First World produce more value in a given time than Third World workers. We must also ask the question of why it is that there is such a high concentration of fixed capital in the First World. Who performed all the labor embodied in our machines and raw materials? There is a broader implication in this appeal to advanced technology as the source of the high living standards for workers in the First World: it is a manifestation of the “theory of productive forces.” To say that workers in the First World have access to much more wealth than Third World workers because of advanced technology is to imply that all people can live like First Worlders, and that they can do this by developing productive forces. This is perhaps the most dangerous lie that still persists in much of the “left.” It encourages us to ignore that both the high living standards and the concentration of capital in the First World are a result of ransacking the oppressed nations, and ultimately it encourages us to forget class struggle. If living standards much better than what most of the world’s workers currently have can be attained merely through developing advanced technology, what point is there in socialism and communism? In Marxist terms, there are two ways in which workers can produce more value in a given amount of time: if the skill of productive work increases, or the intensity of productive work increases. One might argue that the skill of labor in the First World is much higher than the Third World. What does this mean exactly? Marx considered skilled labor to simply be multiplied unskilled labor; that is, skilled labor is ultimately reducible to a quantity of unskilled labor. A clear explanation for why this is was not put forward by Marx, he only stated that it must be the case in order to allow for commodities produced by skilled labor to be exchanged with commodities produced by unskilled labor. We don’t have to get too creative to think about why skilled labor is multiplied unskilled labor though. For example, the training time that goes into building skills involves the use of many commodities produced with simple (unskilled) labor. The simple labor involved in the training of skilled laborers is subsequently transferred to commodities produced by the skilled laborers. This leads us to the question: who is doing the simple labor that goes into the education of skilled laborers? Is it primarily First World workers, or Third World workers? Moreover, most of what we think of as “skilled” labor in the First World is non-productive labor; that is to say, it doesn’t add value to any commodity. Is productive labor in the First World really more skilled than Third World labor? Perhaps in some cases, but in general, Marx’s predictions about the “de-skilling” of productive work have held true. The intense division of labor in modern productive work means that the variations in skill between various forms are generally small. Additionally, even skilled labor (productive and non-productive) is increasingly being outsourced to the Third World due to lower labor costs. Intensity of labor is also much higher in Third World exporting sectors, which dwarfs what differences in skill there may be. Workers in Third World countries who labor in sectors producing goods for imperialist economies generally work longer and harder than First World workers, and are made to do so through the violence of imperialist states. In short, First Worldists have thus far failed to demonstrate any way in which First World labor produces more value than Third World labor, and arguments that attempt to do this end up arguing in essence (explicitly or otherwise) that First World workers are somehow “better” than Third World workers. This will not do at all. Capitalism is not the United States and Germany, with India and Ethiopia only “halfway” capitalist. Capitalism is the United States and India, Germany and Ethiopia, taken together. This means that labor-power has but a single value, that which is associated with the level of development of the productive forces taken globally (the General Intellect on that scale). In answer to the polemical argument that had been put against him—how can one compare the value of an hour of work in the Congo to that of a labor-hour in the United States?—Arghiri Emmanuel wrote: just as one compares the value of an hour’s work by a New York hairdresser to that of an hour’s labor by a worker in Detroit. You have to be consistent. You cannot invoke “inescapable” globalization when it suits you and refuse to consider it when you find it troublesome! Let us recall why it is we can compare labor in various locations in a capitalist economy. Capital will flow wherever the most profit can be generated. This enforces certain standards and averages, and labor becomes abstract. This is what makes commodities commensurable. There would be no basis for exchange of commodities if labor in one place was somehow categorically different than labor in another place. Labor is in fact the common element that allows commodities to be exchanged. Applying this reasoning to a global scale is only the natural extension of Marxism to the world we live in today. Isn’t the Third World labor that produces commodities for capitalist exchange integrated into the system of capitalism? Don’t the firms which exploit Third World labor compete with the firms that do not? In summary, in light of the work of those such as Samir Amin, John Smith, Zak Cope, and MC5 (from the now defunct Maoist Internationalist Movement), along with the derivative work of myself and others, which has revealed that Third World labor accounts for most value realized in the First World, the ball is firmly in the First Worldist court. A convincing reason why the large quantity of Third World labor-time embodied in imperialist economies should not mean that we need to seriously reconsider our class analysis of the First World has yet to be presented. Meanwhile, those of us who think these conclusions are significant will be taking our politics to the streets, formulating a more informed class analysis, and using this to help us engage in the tasks that will really bring about revolution sooner rather than later. Here I follow Zak Cope’s accounting of the quantity of Third World labor that contributes to imperialist economies. Cope uses 2009 statistics. Zak Cope, Divided World, Divided Class. Kersplebedeb 2012, 192-195. OECD Statistics, ALFS Summary tables: Annual civilian labour force. stats.oecd.org. 3. Anwar M. Shaikh & E. Ahmet Tonak, Measuring the Wealth of Nations: The Political Economy of National Accounts. Cambridge University Press 1994, 20-37. OECD Statistics, Gross Domestic Product (GDP). stats.oecd.org. Although a breakdown of economic sectors for the entire OECD is unavailable, I used the European Union, which contains 27 countries, to get an estimate. Using 2009 statistics, I took the output of agriculture, hunting and forestry, fishing, industry including energy, and manufacturing and compared it to overall output of the EU. I used this as the estimate of the proportion of productive labor in the First World. This assumes two things: that literally all labor involved in those economic sectors is productive labor, and that literally all of the value embodied in the output of those sectors is produced within the First World. These assumptions actually bias the argument in favor of the First Worldist narrative, as they lead to an overestimate of the proportion of productive labor within the First World, which makes it more difficult to make my case. The reason I say at least is twofold: first, in the process of calculating this, I have made assumptions that are very generous to the First Worldist narrative, meaning that this estimate is conservative. Second, I am treating a worker-year in the Third World as the same amount of time as a worker-year in the First World. In reality, workers in the Third World tend to work more hours per day. PCR-RCP Programme, Section 6. pcr-rcp.ca/en/archives/113. Let’s take the example of the united states. Compile a list of all non-OECD countries. Investigate u.s. trade to these non-OECD countries and measure what percentage of non-OECD economies is accounted for by capital and intermediate goods exported from the united states to the non-OECD. Measure the percentage of non-OECD economies that is accounted for by exports to the united states. Weight this percentage by the contribution of u.s. capital and intermediate goods. You should end up with a percentage that represents the proportion of non-OECD economies that is value added to the u.s. economy. Multiply this percentage by the total number of non-OECD laborers (about 2.5 billion) to get an estimate of the amount of non-OECD labor-time involved in adding value to the u.s. economy. You can then follow the same methodology as this article to compare this to the amount of productive labor in the u.s. and get a sense of whether or not u.s. workers are generally exploited. If around 2/3 of value realized in the u.s. is produced in the Third World, u.s. workers are not generally exploited. The 2009 labor income share ratio for the u.s. was .545. Weighted by 65% (following our previous assumptions), this amounts to workers earning about 35% of the total value realized in the u.s. This means that the rate of exploitation for u.s. workers would be negative if the proportion of Third World labor involved in the u.s. economy is similar to what it is for imperialist countries generally (i.e. where workers in the First World only produce about 34% of the value realized there). Here I applied the same methodology as outlined in endnote 7, except I weighted the labor income share ratios by 50% instead of 65%. 11.Zak Cope, Global Wage Scaling and Left Ideology: A Critique of Charles Post on the ‘Labour Aristocracy’, in Paul Zarembka (ed.) Contradictions: Finance, Greed, and Labor Unequally Paid (Research in Political Economy, Volume 28), Emerald Group Publishing Limited, 112. Karl Marx, Capital, Vol. 1, Chapter 1. Samir Amin, The Worldwide Law of Value. Monthly Review Press 1978, 84.